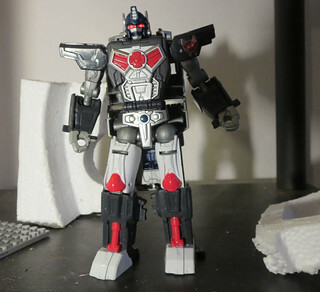 His name is Optimus Primal, and he has no idea when or where he is. He is on another level of the Spire, but the time he comes from is a distant future. Primal himself is a Maximal descendent of the Autobots, who utilizes a combination of Micromaster and Pretender technologies. In the time he comes from the Great War is but a legend, while the Minicon Wars and the search for the Cyber Planet keys are ancient history. There is peace in his time, but he suspects it is just a matter of time before war again erupts between the Maximals and the Predicons.